February isn't until tomorrow (well, sooner rather than later for some of us! ), so I've posted the themes for February, as well as a whole bunch of freebies to go with them. This month's themes will be Love (of course! ), Music, and Winter. The January themes will remain up until tomorrow, and will then move into the Archived Section. For as long as the patterns remain available online, the links will be active and you'll be able to access them. I do check periodically and remove inactive links, so again, if you see something you like, it's best to save it right away. Also, if you know of any freebies I missed that fit these themes (or would make a good ornament in general), please let me know!! Remember, you're not obligated to stitch any of these themes or patterns - they're just suggestions to help you narrow things down if you'd like. You're always welcome to stitch and post whatever you like. I'll also be posting the list of February Featured Stitchers later on today. Stitchers are chosen mostly at random (I use a Birthday List to make a few selections so stitchers can be honored in the month of their birthday). Since the object of the featured Stitchers list is to showcase stitching work, only stitchers with active blogs (updated in at least the last 4 months) or online photo albums will be selected. I've had several comments that people really enjoy visiting each other's blogs, and it's nice to see the most current blogs. A blog or a photo album is not a requirement for membership, but it's always nice to get to know your fellow stitchers whenever you can, and perhaps participating here will help inspire non-bloggers to start their own and share their stitching with us. Thanks for the invitation to join this SAL. I hope that this group will keep me motivated to get some more ornaments stitched and finished. I needed this one to be really quick so En-Joy!!! I enjoyed stitching Lizzie Kate's freebie. Instead of doing all the crosstitches in the border, I elected to do the red and green (in the border) as smyrna crosses which help to speed things up. Source - JCS ornament magazine (ie JCS 2007), book title, etc. If the pattern is a free pattern from the internet, label the post with "freebie", and if possible, provide a link or a website so your fellow stitchers can find it if they'd like to stitch it for themselves. You may also choose to label your posts with your name / nickname so that stitchers can click on that label to see everything you've posted. This is completely optional, however, and I didn't correct posts to include names if they weren't originally labeled as such. 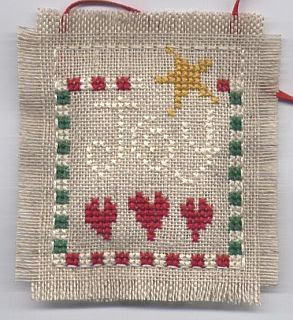 Let's say you want to see what's been stitched from the 2006 JCS ornament issue. All you would have to do is click on that link listed under "Labels" and it will bring up all the posts tagged with JCS 2006. Or what if you want to see all of the Hillside Samplings or Prairie Schooler ornaments that have been posted. You'd click on that link and they would come up. As you can see, this is a pretty useful feature. Labeling posts is very easy. At the bottom of the box where you enter your new posts, there is a box for entering labels. Blogger will even auto suggest labels from the current list as you start typing in that box. If your label is not auto-suggested by Blogger, it only means that it is not already on the list, so you should continue to enter it. Labeling will also help make sure that designers are getting proper credit for their work. A lot of these designers operate on a small business level and work hard at creating these gorgeous designs for us. Their talent and creativity should be honored by giving them the credit they deserve, so be sure to label your posts appropriately and respect their copyrights. (On a side note, I know there are designers who have blogs of their own and participate in the blogging community, and I am sure they enjoy seeing their designs come to life at the hands of so many stitchers). If you have any questions or issues, please don't hesitate to email me. Thanks! Thanks so much Jennifer for letting me join the group. My name's Mylene and live in the Netherlands with DH and two kids. This is my January christmas ornament that i've finished into a pinkeep. Thought at first to do it heart shape but í find the aida not easy to fold. 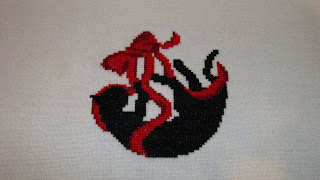 Might try to stitch it on white linen/evenweave next time... i hope. This design is from Jo Verso which was featured in one of the quick and Easy magazines years a go. Stitched on 14ct red Aida with blanc DMC thread. 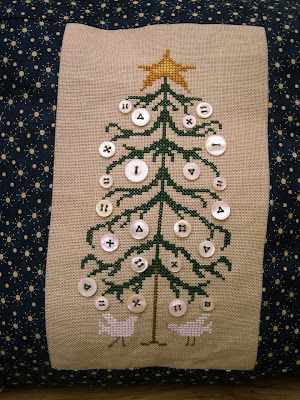 I hope to stitch/finish an ornament and a x'mas card each month. Cards are also completed for this month and it's on my blog for anyone who wants to have a look. I am sure joining you here will keep me motivated to do so. Looking forward to see everyone's christmas stitching! It's been a while since I've contributed to the blog due to not having my stash around me - but I can finally add a stitched ornie to the SAL ... in the middle of moving house I can't access my finishing materials yet, but at least the stitching's done! 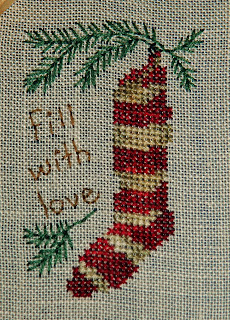 This is Fill With Love by Designs by Cathy Jean (2007 JCS ornie magazine). 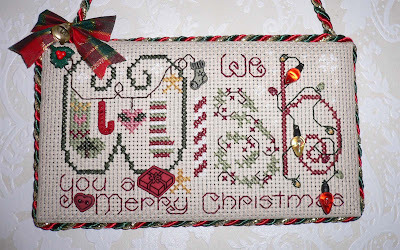 I stitched a design by "With my needle" (Just cross stitch, Christmas ornaments, Special Christmas Issue 2003 (pillow) und 2006 (scissors fob)) using an Anchor thread. It was a birthday gift (exchange). I have been reading this blog on and off the last few months. Last year I only stitched a couple of ornaments but I decided to invest more time on ornaments this year. It is nice stitching with a group. So where is the picture of my January ornament? Well... I haven't finished it yet. I stitched over the weekend but no where near the time needed to complete the ornament. As soon as I finish stitching it I will post a picture. In the meantime it has been wonderful looking at everyone else's ornament. They are delightful and inspiring. On the positive side I kitted up my February and March ornaments last night and made a list of the ornaments I will stitch for the rest of the year. The reason for this is if I have to order floss because my LNS doesn't carry it I want to get it all at once. Hi ladies and any gents out there, I know that there are male stitchers and would not want to miss out any of them (my husband is a stitcher and knitter). 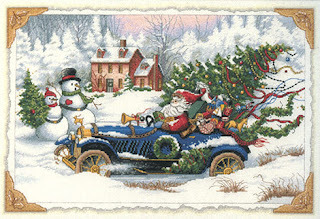 Anyway as I said I am new to this group, have viewed this site a few times and have admired all those lovely ornaments. Just love all the different finishes. Hopefully will try out some new finishing techniques, I usually just put them into small tuck pillows. I love the flat ones with pins around (how are those made?). Last year I made quite a few ornaments and gave them out instead of christmas cards but making lots before christmas was quite a challenge, so will be nice to complete themduring the year. I have quite a few JCS ornament issue and so cannot wait to stitch from them. I love sitting out in the summer on my decking which over looks our pond and stitching christmas items. I love snowmen and will stitch anything, anytime of year, I'm not a seasonal stitcher although I do love stitching christmas items. This is my first post so I hope I get it correct. 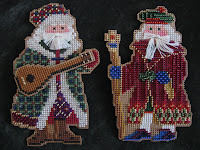 Just finished 2 Mill Hill Santas - worked on perforated paper. I have quite a collection of these worked plus I have some kits in my stash and will aim to have them all worked before the end of the year. The one on the left is Mandolin Santa from the Musical Santas series and on the right is Avignon Santa from the Medieval Santas series. I usually put a small, flat magnet on the back and at Christmas cover the doors of my refrigerator with them. For January's ornament, I did a freebie pattern - Lizzy Kate's Joy. It has to be one of the easiest patterns I've done in an long time. Start to finish was about 3 hrs (with kid interruptions ;o) ). Thread is DMC and fabric is 18 ct Charcoal Aida. I started this ornament last July and finally finished it this weekend. For more pictures of its progress see this post on my blog. I'm Janet from sunny Malaysia. I was encourged to join this SAL by my dear friend Barbara and here is what I've stitched. Hi, I'm Deborah from Tallahassee, FL. I have been looking at your blog for about a week and really love it...I'm new to this also, so please forgive mistakes. 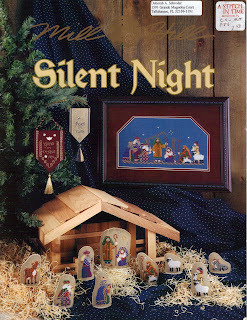 This year I am going to stitch the Mill Hill "Silent Night" nativity as standing figures. I was able to find the stable (almost identical) from Wal-mart about 2 years ago, so it's time I do the stitching. 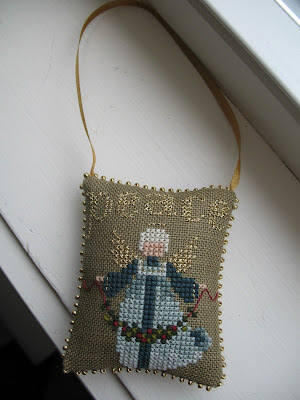 I just finished stitching my January house ornament for the Bride's Tree SAL in which I am participating. This pattern is from a mystery SAL I am doing in the wXSw yahoo group and is designed by Helga Mandl and Barbara Ana. I just loved the house in the design so much that I decided to use it for an ornament. Okay I'm very new to this so if I make mistakes please do let me know. I have decided to stitch all the Shepherds Bush ornaments from JCS ornament magazines. That is eight ornaments. 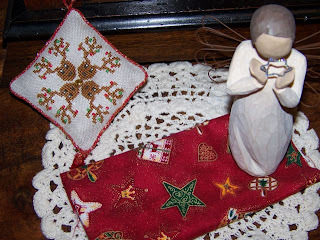 I also intend to stitch a hardanger angel for the top of the tree. Thanks to Jennifer for answering so quickly and inviting me to join. My name is Sue and I live in Wollongong NSW Australia. I have been an ardent watcher of the ornaments posted to this SAL for a while now and finally decided to be brave and share the ornies that I stitch this year too. Thank you Jennifer for inviting me to join. I plan to stitch a card as well as an ornament each month. Hopefully with a quick & easy design. My ornie is from the 2007 JCS Christmas Ornaments Magazine by Val's Stuff called "a Merry Kitty Klaus", stitched on 18 count white & gold Floba over 1 thread using DMC threads and white Wisper Thread for his hat. The card is an adapted design from a picture I saw, I used Needle Necessities threads on 25 count white evenweave. Now to decide on February's ornament & card. I've been working on a few different ornaments - it's nice to have smaller projects for my shorter attention span! My DH and I are HUGE Dallas Cowboys fans, and every year, we try to add another Cowboys ornament to our growing collection. I saw this one as a design on etsy.com and thought, "Hey, I could make that", so I made up a pattern and customized it for one of my DH's favorite players, Roger Staubach. It's not finished yet - I'm stitching on plastic canvas which is sheer torture to my fingers, so I only do a little each night. And in case you were wondering, DMC 823 perfectly matches my blue Dallas Cowboys jersey. 415 is a pretty good approximation for the silver on the jersey as well. I had so much fun designing the Cowboys one, I made one for most of the rest of the teams (I still have a tiny grudge about the Patriots. LOL) If you want one, let me know and I will send a pattern to you. I've also been working on some Princess ornaments, based on a free pattern I found on Cyberstitchers. My 5 year old niece is very into princesses, and ever since she heard my DH refer to me as "Princess", she calls me Princess Aunt Jenn. We also have a cousin who is a "Princess" herself, so I thought it would be fun for all three of us to have our own Princess ornaments! Here are 2 so far. The pattern calls for small stitched stars, but I substituted some sequins and seed beads instead for the one on top. I might change it up a little for the second one, I'm not sure yet. I've also been working on some ornaments for my Bride's Tree SAL, which you can see here. Here is my ornie for this month. 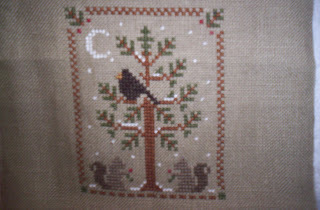 It is Woodland Snowfall by Little House Needleworks and it's from the 2004 issue of JCS Ornaments. I can't wait to get to the store to get some jute twine to make the little bag that it gives the directions to finish it as. Now to start thinking about what ornie I will stitch for February's SAL. This makes 2 ornies that I have gotten done so far this month. This upcoming weekend - January 26 & 27 - is our official SAL weekend. Many of you have been stitching all month and posting pictures, which is great inspiration! But if you haven't stitched anything yet, now is the time to pick an ornament or two and gather up your supplies so you're ready for the weekend when we'll all be stitching together. If you're really at a loss, or just can't decide what to stitch, take a look at our suggested themes. You're not required to stitch those subjects, but they can be a great help in narrowing down some pretty overwhelming choices. And if you have suggestions for future themes or links to free patterns that would make great ornaments, please let me know. I've been collecting themes and patterns and will try to feature at least 3 with freebies every month. As a reminder, if you see a freebie you like, be sure to download it and save it to your own computer or print it out. It's so disappointing to go back for something and not be able to find it again. Also, make sure you're keeping track of the designer, or at least the website you got it from so that proper credit can be given. Remember when you post your picture to credit the designer or publisher of the chart you stitched, if applicable. You can also list threads and fabrics if you like. Your posts should be labeled with your name, and the theme of the ornament plus the designer as well - just to make it easier for people browsing the blog to find what they're looking for. And it's not too late to join! If you have friends or blogging buddies working on ornaments, send them our way and have them join us. The more, the merrier! 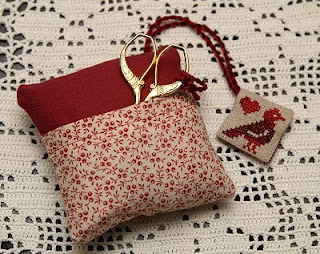 You can also link to this blog from your own personal stitching blog. Thanks Tanya & Ruth. It did rain some. I'll just pretend they were snow! LOL!! Ok, it's Barbara's fault ~ I saw this link on her site this morning and since I had an ornament-style design (let it snow freebie) nearly finished; well, he became numero uno in this SAL and thank you Jennifer to adding me so quickly. Excited to be in the SAL! 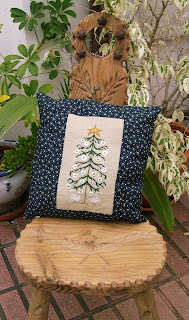 This month I did just a little finishing, sewing a small pillow. The stitching was already done a couple of months ago. 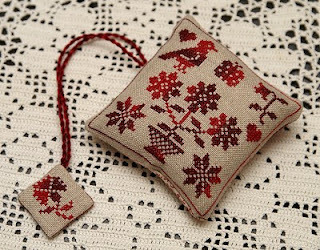 This design comes from The Drawn Thread, I like it very much and I did it already several times. It is funny to use old buttons for it. I see, our blog had a big change, just great, thank you! 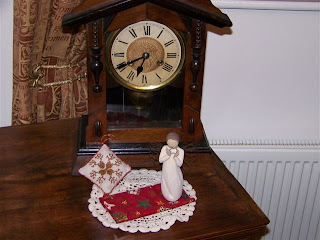 If you're running or involved in any kind of ornament SAL that you'd like to post about here, please let me know, and I'll set up a link to your SAL blog or site. For instance, I am also doing a Bride's Tree SAL for ornaments, which will remain open to all stitchers whenever they want to join. So let me know if you're doing any kind of ornament SAL. Hello, this is my Christmas ornament for January. 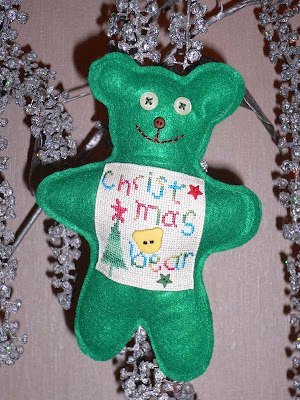 Christmas Bear from The Gift of Stitching (December 2006). Stitched by DMC variations threads and Weeks Dye Works threads on linen Aida. Christmas toy for my little son. He likes this bear. Greetings for everyone from Moscow (Russia)! I have finished it into any ornament, but I haven't got around to getting a picture of it yet. This is my first post to this blog. I joined sometime last year with the good intentions of stitching an ornament each month. Unfortunately, that didn't happen but I'm determined this year will be different! I joined a 2008 Ornament Challenge with an Aussie Stitchers Yahoo group I belong to. 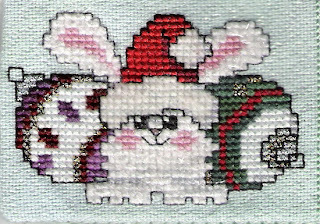 The aim is to stitch an ornament a month from the 2007 JCS Ornament mag. I'd like to thank the Holiday season for catching me almost completely off guard, once again! I have updated my blog if anyone is interested in reading it, and hope to be much more current with it in 2008, LOL. 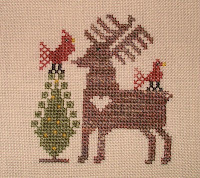 This is one I stitched from the 2007 Just Cross Stitch ornament issue. I modified the colors to fit what I had on hand and left out the sampler alphabet that is supposed to go on top, since I wanted more of a pillow and less of an ornament. This is Christmas Holly by Hands To work. I really like how it turned out! Hi everyone! I'm Lynn, a new member to the group and want to thank Jennifer very much for the invite. I mentioned on my blog that I hoped to get some ornaments done in the new year and I'm hoping that all of you can keep me motivated to do just that. I finished my first ornament just after the New Year although it was a work in progress since the beginning of December. Holiday activities just kept pushing it aside. I'll post this as my first contribution to the group. I'm new to finishes so bear with me since that may take me a bit longer! In addition to the new look, there are a few other goodies on the way, so keep an eye out for them. One of the things we'd like to set up is a Suggested Theme of the Month. I know some stitchers have a hard time deciding which ornaments to stitch, so by providing a suggested theme, it can help narrow down the choices and make choosing a little easier. You don't HAVE to stitch the suggested themes, but it can be a real lifeline for stitchers drowning in a sea of decisions! I think 2-3 suggested themes a month is a good number, and the January ones will be coming by the end of the week. If you've got themes in mind, please let me know as we're in the market for suggestions. I have a few surprises coming later today or tomorrow, so I'll keep those under wraps for now, but introduce myself. My name is Jennifer, and I live on the east coast in the US. I've been cross stitching for 5-6 years now. I've done embroidery for as long as I can remember (remember the iron on transfers?) and a little stamped cross stitch in HS, but always felt intimidated by cross stitch until my DH and I picked up a few kits at the craft store as a way of curbing night time snacking (you can't snack if your fingers are busy stitching!) The stitching bug bit, and here we are still stitching. I've graduated from pre-packaged kits to putting together my own flosses and fabrics for a chart to doing a little of my own designs. Most of what I stitch is given away as gifts, so my themes and choices of designers vary greatly. If you'd like to see more of my stitching, you can check out my blog. I look forward to working with you all and making this SAL a good experience for everyone. I think it will be a lot of fun to see what everyone stitches throughout the year.